Our Help at Home in Edinburgh isn’t just a service, it’s a lifeline. That’s what our years of zest philosophy is all about giving you as much or as little help as you need to ensure you get the most out of life. We offer help to those who are finding it more difficult to manage every thing at home. We support people with dementia, poor mobility or ill health, as well as those who care for them. 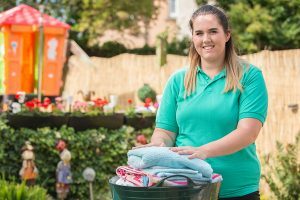 We can provide assistance on a regular, long term basis or we can help you while you get back on your feet after illness or a stay in hospital; doing your shopping and keeping housework up-to-date until you recover fully. We will tailor what we do to what you want and need. From full house cleaning to a hand with specific tasks. Anything from picking up a few items to full weekly shopping. We can support you with everything from making a list to setting up a payment system that works for you or a relative. Including ironing and changing bed linen. We are also happy to do things like making sure plants are watered, checking your fridge is replenished, and assisting with any other household tasks. Crucially, whatever you want us to do, we’ll do it thoroughly and professionally. A great service, so helpful, professional and nothing is too much trouble. All of our staff are fully vetted as members of the Protection of Vulnerable Groups (PVG) Scheme. They also receive ongoing training in health and safety, dementia awareness and other relevant courses. We understand that Help at Home may be the first time you will have required assistance in your home so we arrange a regular staff member to visit you, who will get to know you and understand how you like things done. We’re here to help with what you need done. So we can keep to the same tasks each visit or you can tell us what you want done on a particular day. Help At Home is part of LifeCare, we have 75 years experience working with the people of Edinburgh so we can draw on extensive resources and knowledge to give you the best possible support. We charge a flat fee, by the time we spend with you, not by the task. This is invoiced monthly. There is no contract. No commitment. You may be eligible for Direct Payments (Self Directed Support), which can support you to purchase this service or you may wish to use your Attendance Allowance. Our visits are a minimum of one hour, visits are tailored to suit your needs. Help at Home is available Monday to Friday, from 9am to 5pm. We cover the whole of the City of Edinburgh. If you wish to go ahead with the service, we can arrange to visit you at your home to assess what you need with no charge or obligation. We can then start the service as soon as possible.